Vintage Kids' Books My Kid Loves: Little Boy Brown Reissued, WOOT! I received a catalog in the mail this week from the always awesome Enchanted Lion Books. Upon casually flipping through the pages, I was delighted to come across Little Boy Brown, a lost beauty I've long championed here on VKBMKLs. This is one of my top five favorite vintage children's books EVER. Quirky, strange and savagely sentimental. All my fave components to a good book. Looks like they will be reissuing it just in time for Christmas, November 2013, and I couldn't be more thrilled. It's good to have the children on my holiday list already crossed off. Getting a head start! It also happens to be the last week of school here in Texas. Third grade, here we come! I couldn't wait. I snatched a former library this morning as soon as I read it. In any case, I like the old books a lot and I will not have to wait. Strange things, but yesterday I also bought another Christmas book. 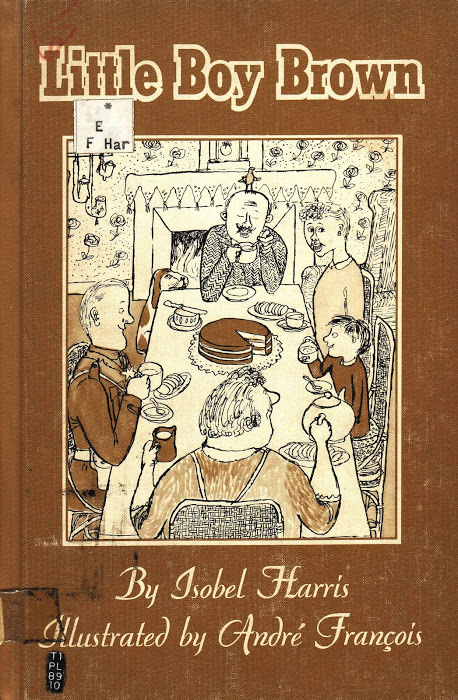 I never knew that there was a charming Scholastic edition of Holly and Ivy from 1958, illustrated by Adrienne Adams. I only knew the Barbara Cooney, and what bothers me about that book, it's the odd shape and size. I do not like much those over-sized non cozy picture books. I cannot have that intimacy with that type of book. Wow. I was thrilled to see that they are re releasing this. What a great book. Although, I was not thrilled with the size. I guess we can not have it all, right? Hi, can i ask you something? You seem to know a lot about children books and illustrations. The thing is, I’m looking for children books with “scary” animal illustrations like the big bad wolf (or a fox) eating pigs (or seven kids or Red Riding hood or birds in Chicken Little) or being pictured with a fat stomach. Could be any other animal as well. I need it for my research. Any sort of help is appreciated. Thanks in advance. Great story and great illustrations. Story sounds very interesting, can't wait to read it on.